This year has been one of particularly strong growth and community engagement for the OWC. Please visit oldmanwatershed.ca for more information, and to become part of the team! Providing information and inspiration to the community. We are particularly proud of our Historical Timelines, which comprise over 500 entries of text, maps and photos, ranging from 60,000 BCE through to present day! That's a lot of history -and has never before been woven together from a unique watershed perspective. What were the major events and decisions in the past that continue to affect us in the present? What are the lessons learned so we can avoid making the same mistakes today - and pick up on what was done right? By understanding better where we come from, it is easier to chart a strong, confident course for the way forward. The project was funded in part by the Alberta Historical Resources Foundation, and attempts to help citizens and policy-makers at every level understand better how decisions and events in our past continue to impact contemporary watershed management and health. Running in parallel to the timelines are an impressive series of maps that depict land use from traditional Blackfoot land use practices through to projections for the year 2060, based on a ‘business-as-usual’ model. The map series have sparked great interest in the community, and we have been honoured with a number of presentation requests. Also new this year are several videos, which were created in collaboration with community partners. The videos address 3 core demographics: scientists, the general public, and children/parents/educators. Our Collaborative Partnerships make this possible. They provide some of the funding and a best-practice example which we use to showcase watershed work in Southern Alberta. The City of Lethbridge’s suite looks at water and wastewater treatment innovation, everyday water consumption and habits, and tips and tricks to improve stormwater and urban watershed health. The Potato Growers of Alberta are our showcase for rural watershed health. These videos cover what it is like to create agricultural abundance in a semi-arid climate, how snowpack in our headwaters contributes to crop success, and what consumers need to know about water and soil management in Alberta potato production. Currently, we are working with the County of Lethbridge to develop their 3 videos, which will showcase important aspects of watershed management in Southern Alberta. We continue to add to our digital archive, which is used by media, government and community organizations as a rich source of photos from throughout the watershed. These include nature photos, landscapes and all kinds of volunteer work in boardrooms, fields and rivers throughout the Oldman watershed. We welcome guest photographers! We have stunning photos of our watershed, its flora, fauna and people. You are welcome to download and use any of them - please credit OWC - and the photographer, if listed! Our social media outreach continues to grow, with a topical blog on a variety of subjects being released 1-2 times a week. Guest bloggers ranging from scientists and educators to policy makers and business people contribute timely and topical articles in addition to the staff contributions forecasting or summarizing our events, initiatives and projects. We are now able to reach about 25,000 people every week though the 7 channels we maintain. The blog is searchable by author, date and topic. Please get in touch if you'd like to submit one! Volunteer, Donate, Make A Change. Whenever we engage the public, we try to inspire them not only to learn, but also to take action. In fact, “Moving From Talk to Action” has been one of the main themes at OWC in 2017. Based on a talk we gave at the University of Lethbridge to the ‘Global Citizenship Cohort’, a team of 7 students started their own Adopt-A-River project and chose a location near Taber, AB. They learned about water and soil testing and used their project as a platform to inspire others and set examples. In fact, one of the participants earned our “Triple Crown”: Not only did he volunteer, but he donated (twice) and has become our youngest-serving Board Member! The group was one of 42 signatories of the Southern Alberta Water Charter (#SAWC17). Based on United Nations legislation from 2010 that declared clean water a human right; the Canadian federal government’s Water Act of 1985; and the province of Alberta’s Water For Life Strategy in 2003, OWC sought to produce a powerful document that would inspire municipalities, counties, businesses, communities and families to move from talk to action and pledge to undertake a project for the betterment of watershed management and health. The challenge opened May long weekend with a moving signing ceremony at Lethbridge City Hall that was opened by traditional song and drumming composed especially for the event by the North Blood Drummerz. Signatories had until September long weekend to complete their actions, and OWC was busy documenting the projects with photos, interviews and blogs throughout the summer. North Bloodz Drummers composed a traditional song especially for OWC about the Oldman River. The group drummed in the signing ceremony with Mayor Chris Spearman at Lethbridge City Hall on April 7th, 2017. Minister of Environment and Parks Shannon Phillips honoured us with both words of praise and by presenting the OWC awards to recipients at the Closing Ceremony held in November. Sponsored by the Alberta Real Estate Foundation, #SAWC17 inspired not only many projects and enthusiastic media coverage, but highlighted the ability of everyone - and anyone - to take concrete action toward better watershed management and health. The youngest signatories were members of a daycare who participated in the City of Lethbridge’s Yellow Fish Road and Gutter Buddy programs. #SAWC17 has sparked interest from other communities with a roadmap to increased community engagement and concrete actions. As with every WPAC, all of our work requires stable funding. We were lucky to have received the commitment from Minister of Environment and Parks Shannon Phillips for core operating funding. This enables us to plan our projects, and hire a fund development specialist to help us become more robust in our charitable outreach. OWC has recently launched The Watershed Fund and published our Case For Support, which outlines persuasively the need for donations and sponsorships, what the major watershed challenges in the Oldman basin are, and how our research and projects address them. Fine-tuning our database was part of this process and we are now better able to communicate with our stakeholders and run fundraising campaigns. The OWC is also running its first casino ever, and we greatly appreciate all the volunteers who stepped up to take a shift. We are lucky that we have extremely dedicated volunteers who are supporting us in our fundraising efforts, including the formation of a fund development committee. Headwaters, Tailwaters … and everything in between. Already in its third year, our Engaging Recreationists Program has gone from a tentative pilot project, to gaining attention as a model for action throughout Alberta. Reducing threats to the headwaters is Goal 3 of our Integrated Watershed Management Plan (IWMP). The program engages backcountry users in restoring places where Albertans recreate, changing our behaviour to reduce impacts, and becoming better environmental stewards. OWC works with a variety of people and organizations, including motorized recreationists, random campers, anglers and boaters. 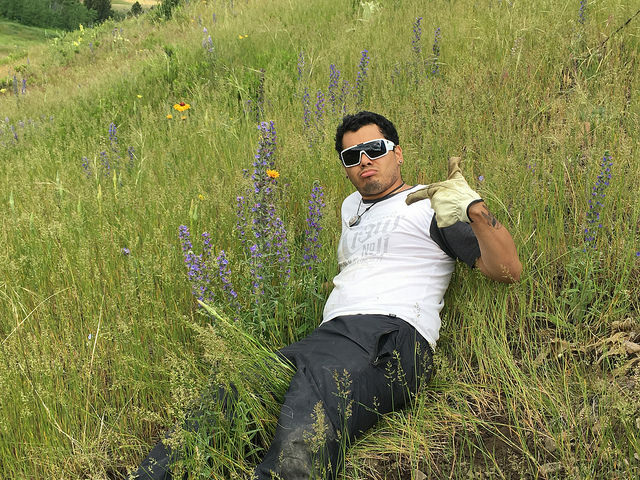 Chico was one of 4 Outreach Assistants busy this summer - here he is battling blueweed! OWC is helping people understand the cumulative effects of each human footprint. Our Headwaters Action Plan emphasizes sound science, stakeholder engagement, education, community-based social marketing, stream bank restoration, and stewardship activities. Together with community partners, we are also encouraging motorized recreationists to keep wheels out of water, and the positive results are evident throughout the watershed. We are protecting our headwaters, water quality, and critical habitat for threatened species (such as west slope cutthroat trout). Over the years, this project has been funded by the Alberta Environment and Parks Watershed Resiliency and Restoration Program, Environment Canada Habitat Stewardship Program, Alberta Conservation Association, RBC Bluewater Project, Alberta Ecotrust Foundation, Shell Fueling Change, Samuel Hanen Society, The Calgary Foundation, Employment and Social Development Canada and The Roundtable on the Crown of the Continent. It takes a lot of support to make a great project - thank you to all of our funders! Our social media and communications outreach is a 2-way street: We support Government of Alberta messaging (e.g. Know B4 U Go, PlayCleanGo, etc), and we also provide a platform for stakeholders to share their feedback. Over the years, there has been a perceptible shift in on-the-ground conversations - and in the media - with more of a focus on the need for responsible recreation and stewardship in order to ensure sustainable use. Indoors and outdoors, OWC has fun throughout the year engaging people of all ages in watershed management and health. Aren't these great fish?! Similarly, we are fortunate to hire 4 Outreach Assistants for the season, and team up with strong collaborators such as Cows & Fish, Spray Lake Sawmills, Trout Unlimited Canada, Southern Alberta Land Trust Society, Alberta Conservation Association, and Alberta Parks. Rain or shine, the team completed surveys, ran trials with signage and stream crossings, presented to groups, attended events, and helped create a more unified vision of what kind of backcountry Albertans want to have. 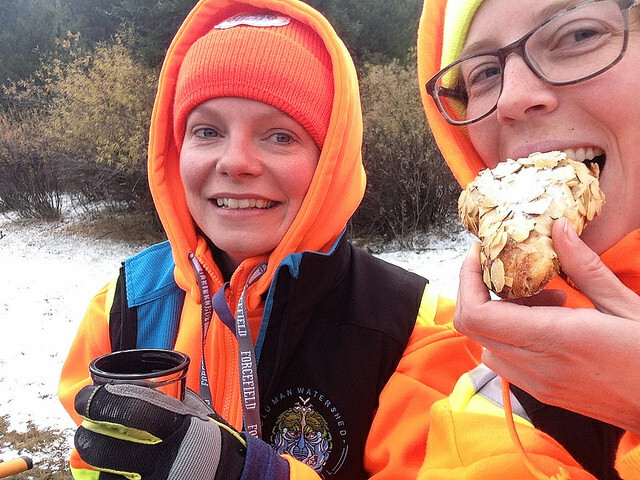 OWC's Executive Director Shannon Frank, and Education Manager Sofie Forsstrom, braving the cold at an autumnn restoration event in the backcountry. Meanwhile, with our rural partners, OWC ran a 3-part community engagement series ‘Voices Of The Oldman’ (VOTO) which invited landowners, producers and agricultural groups from throughout the watershed to help re-envision our Watershed Legacy Program (WLP). The Oldman watershed includes some of the most productive farm and ranch land in the world. The OWC is proud of its reputation as being a "hands-on" organization and we work on the land, directly with our rural stakeholders. WLP provides the tools necessary for watershed stewardship groups (WSGs) and landowner cooperatives to take the next steps toward sustainable management of their land. By coordinating efforts throughout the basin, the WLP aims to conserve and enhance our natural resources and the rural way of life. The feedback from the VOTO sessions indicated that the agricultural community feels a strong need to bridge the gap with urban consumers, and to address both misinformation and the need for education about what happens on the land. Social license is clearly the main issue of concern that was identified by participants, and OWC has subsequently presented to a number of groups on this topic, including the Crop Sector Working Group. OWC regularly advises the Minister of Environment and Parks on headwater issues and encourages the creation of recreational user fees to support increased enforcement, restoration, education and properly designed and built trail systems within a limited linear footprint density. The OWC is also providing information and recommendations to Government of Alberta staff who are leading the processes to establish the South Saskatchewan Biodiversity Management Framework, Livingstone and Porcupine Hills Land Footprint Management Plan and Recreation Management Plans and Castle Park Management Plan. 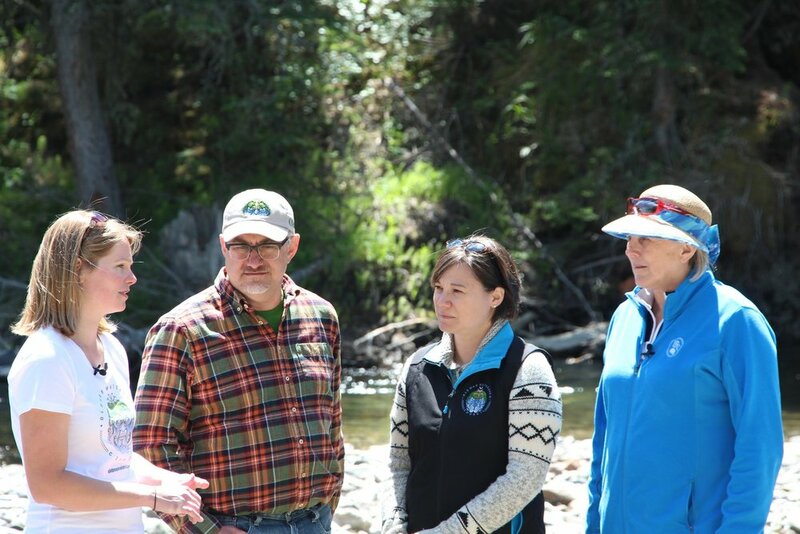 OWC Executive Director Shannon Frank, and Chair Doug Kaupp, showing multiple use effects to Environment and Parks Minister Shannon Phillips, and Lethbridge East MLA Maria Fitzpatrick, in the Dutch Creek subwatershed. Newer PostTis the season for charitable giving?